In the proposed game number I we saw how agents that are exactly the same follow the same instructions and generate a complex collective behavior. In this present game, the agents follow identical instructions but are initially characterized by three different states. In nature, for example, in the case of developing a body like hands, there is also this distinction or separation of tasks (skin, muscle, bone). In this game we will see what happens when these three differentiated groups follow the same instructions. Let's play this swarming game! Material: Any way to mark the hands of children (colored ribbons, stickers, make up, pen or charcoal drawings cork). You need to establish a code of three signals (e.g. yellow / blue / colorless; 1point / 2points / no points). Time required: 10 minutes preparation, game 5 minutes, 2 minutes conclusions. 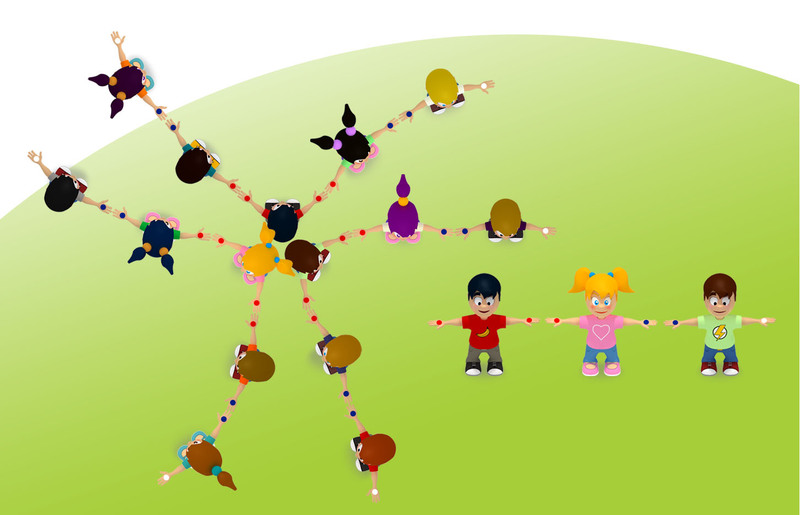 Number of players, better 15 to 20 in a room or outdoor space allowing free movement. They can be divided into two teams (or more) to motivate children to solve the challenge before the others. For each team of 15 players, set up a group of 3 (group A) and two groups of six (groups B and C). For 20 players, one of 4 and two of 8. Mark a signal (yellow, for example) the two players' hands of Group A. Mark with the same signal (yellow) the right hand of each player in the group B and another signal (blue), the left hand. Mark with the other signal (blue) the right hand of each player in the group C.
You must give your hands with arms outstretched. Each marked hand must match with another marked hand. No one can shake hands with another player with the same marks in both hands. Players from group A should stay with their back towards the other members. Children can find as alternative solution to keep the arms crossed; in this case instructors can add an additional instruction: you have extend your arms, uncrossing them. Click here for after-playing discussion and conclusions! Adapted from Ready, Set, Self-Assemble, developed by the Children’s Museum of Houston (http://www.nisenet.org/catalog/programs/exploring_fabrication_-_self-assembly_nanodays_10). Published under Creative Commons Attribution-Noncommercial-Share Alike License.